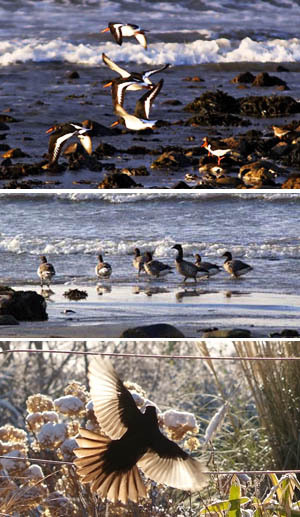 Bertra Beach and the adjacent tidal flats and wetlands is a haven for seabirds and migratory birds such as Geese, Ducks, Waders, Herons, Gulls, Terns, Cormorants, Snipes and many others. This peninsular and beach is very attractive as a habitat or migratory ‘fuel-stop’ for many species due the abundance of feeding areas both on tidal beaches, wetlands and unspoilt landscape. Nearby and within easy reach for birds are boglands on Croagh Patrick, wild Oak forest areas on Old Head and many streams and rivers. There is also a wide variety of Song Birds eg. Skylarks – nesting in the Dunes, Bluetits, Finches, Sparrows etc. Swallows are common. All the bird photos on this page were shot within a 1 mile radius from our house including the winter photo on our deck – so bring your camera and binoculars when visiting. Photography has always been a part of birding, but in the past the cost of good cameras and long lenses made this a minority, often semi-professional, interest. The advent of affordable digital cameras, which can be used in conjunction with a spotting scope or binoculars have made this a much more widespread aspect of the hobby. The arrival of affordable digital and video cameras has made them more attractive and accessible to the birding community. Cross-over, non-linear digital models now exist that take high quality stills at high resolutions, as well as being able to record and play audio and video in HD. The ability to easily capture and reproduce not only the visual characteristics of a bird, but also its patterns of movement and its sound, has wide applications for birders in the field.BirdWatch Ireland is the leading voluntary conservation organisation in the Republic of Ireland, devoted to the conservation and protection of the Republic of Ireland’s wild birds and their habitats. BWI has over 10,000 active members and supporters, and a network of 20 branches actively promoting the importance of birds and habitats, and general conservation issues. It publishes the annual journal Irish Birds and the quarterly magazine Wings. Other Wildlife in the Clew Bay area includes a wide variety of fish, shells, clams, cockles, crabs and lobster. 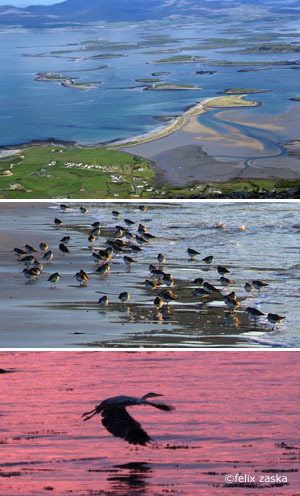 There is also mammal sea wildlife in Clew Bay that can be observed from Bertra such as Seals and Sea Otters. Further out and around the Islands of Clare, Inisturk and Inisbofin there are sightings of Dolphins, Whales, Orcas and Sharks. Achill and Blacksod Bay to the North used to be whaling stations in past centuries.